Preventing the use of weapons of mass destruction (WMD) against the United States and its allies has long been a paramount security objective for Washington with increased urgency since 9/11. When it comes to mitigating the threats posed by North Korean WMD, the United States has long followed a multi-pronged approach that has incorporated, among other elements, increasing resiliency and capacity among our allies in Japan and the Republic of Korea (ROK or South Korea); multilateral diplomacy in the form of the Six Party Talks; various types of active and passive defense measures; deterrence; and planning for the use of special technical teams to secure adversary programs in semi-permissive or non-permissive environments. This last effort, for a long time known as WMD-elimination, was a military mission that emphasized the use of special technical forces trained in nuclear, chemical and biological weapons. 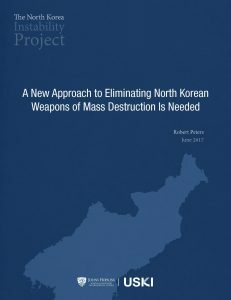 While the Department of Defense Strategy for Countering Weapons of Mass Destruction ended elimination as a formal doctrinal military mission earlier this decade, the Department of Defense (DoD) has continued to plan for and organize, train and equip forces so that it may be prepared to respond to a crisis in which US and ROK forces must secure WMD in North Korean territory. As will be detailed later in this paper, such an effort would require an enormous amount of manpower, resources and planning and would present significant risk to the United States, the Republic of Korea, and the coalition forces engaged in such efforts. Moreover, due to the expanding size of the North Korean WMD arsenal, combined with a greater appreciation of the role that China might play in various contingencies, this paper suggests that the DoD’s old approach to WMD-elimination is flawed, and, should it ever be implemented, would likely fail.